Midnight songs : for flugel horn, trombone, guitar, loop pedals & delay / Katy Abbott. 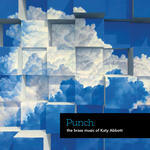 Midnight songs : for flugel horn, trombone, guitar, loop pedals & delay [eScore] / Katy Abbott. The music itself is not complex and leaves room for the instrumentalists to explore the sonorities within the textures, their own instrument but most importantly between the trio. 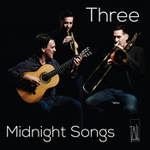 The idea of 'three' is intricately woven into the score and it is the THREE musicians that should bring their own selves to create a new ONE - so to speak. Midnight Songs Movt III: 'Variations' is related to Glisten (solo piano) and Introduced Species Movt III: 'Plummet' through the use of the same melodic theme but all three pieces delve in different musical directions. Instrumentation: Flugel horn, trombone, acoustic guitar (1 loop pedal per player with delay). Difficulty: Advanced — incorporates elements of improvisation and extended techniques. Contents note: I. Lullaby -- II. Midnight Song -- III. Variations -- IV. Lullaby Reprise. Dedication note: Dedicated to Three (Musical group). Dedicated to the members of Ensemble Three: Joel Brennan, Don Immel, and Ken Murray. Commission note: Commissioned by Three (Musical group) with funds provided by University of Melbourne Conservatorium of Music. First performance: by Three (Musical group) — 17 Sep 13. Shanghai, China. 23 Jul 2018: at Organica (Melbourne Recital Centre, Primrose Potter Salon). Featuring Ensemble Three. 11 Jul 14: Sydney International Festival of Brass, Gala Concert, Congress Hall, Sydney. Featuring Three (Musical group). 10 Jul 14: Recital Hall East, Sydney Conservatorium of Music.. Featuring Three (Musical group). 11 Jun 14: Loop Bar, Melbourne. Featuring Three (Musical group). 17 Sep 13: Shanghai, China.. Featuring Three (Musical group).